Hot Chicken is in the house! A little over a year ago, on a sweltering July day in Nashville we made the pilgrimage to Prince's Hot Chicken. Having lunch in the heat of the day at a hole-in-the-wall joint with no AC, eating piping hot chicken straight out of the fryer, coated with burn-your-face-off fiery spices seems crazy. And it was crazy - crazy good! Here in San Diego, our heat wave continues and the conditions seemed right for attempting Hot Chicken at home. But how to make it? 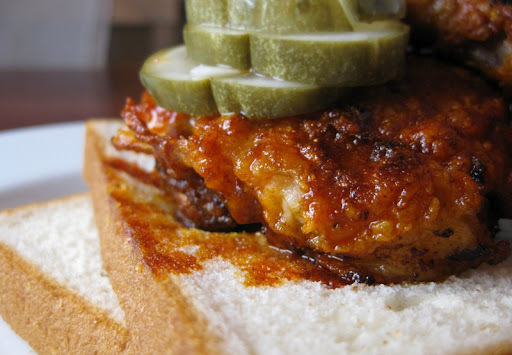 We decided that Justin Jones' contest-winning recipe from the 2008 Music City Hot Chicken Festival was a good place to start. 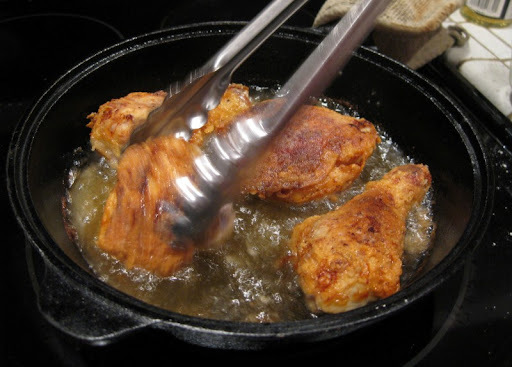 His recipe is pretty simple - a paste predominantly of cayenne and lard that is applied to the chicken after frying. Adding the heat post-frying seems like the right thing to do logistically (keeping the spice out of the cooking oil and allowing different heat levels of paste to be used at the end to customize the hotness of the order on a piece-by-piece basis) and it rings true with anecdotes I've read about the method used at Prince's. We do an overnight buttermilk soak, then dredge in seasoned flour and fry until crisp. Fried chicken was one of Sherry's favorites growing up. Her chicken-frying skills have atrophied over the years, but they are starting to get back in form. After 10 seconds in the microwave on high, the lard loosens up nicely and it can be easily brushed onto the chicken. Once everything is properly assembled, it's time to chow down. Biting into the chicken, the crust crunches nicely, its temperature and spice level challenging with their aggressiveness. The meat inside is savory and juicy, just as fried chicken should be, and temporarily diminishes the burn. But only temporarily - the burn is not to be denied, and builds with each bite. 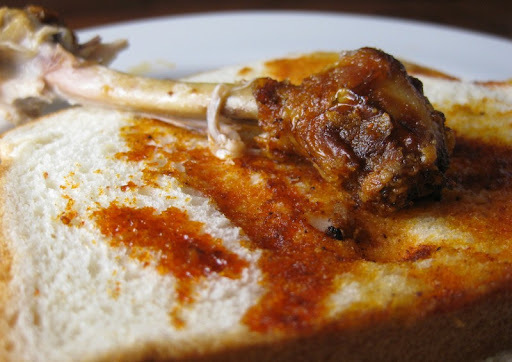 Until you're done, left only with bones and the remaining chile-stained bits of bread. Was it good? Absolutely. Very good indeed. Some of the best fried chicken I've had. 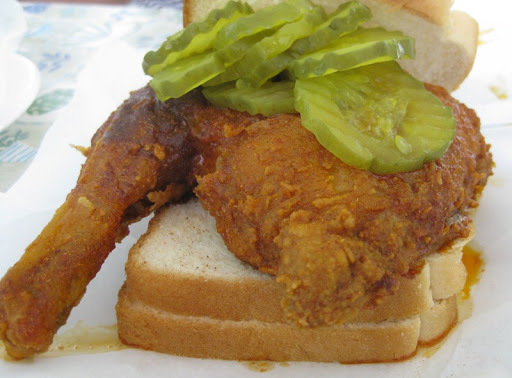 How did it stand up to Prince's Hot Chicken? We've got a ways to go. First, the chicken we had there was extremely well cooked. Ours is good, and getting better, but not yet in the same league. That's on us, though, and not the recipe we used. This was very hot - certainly hotter than the chicken that we made - but isn't very dark-colored at all (aside from the top of the drumstick, which is dark from cooking and not chile). Similarly, the oil on the bread was much more light-orange rather than the deep red we got. Another factor is the bitterness of the cayenne. I really like the complexity you get from powdered dried chile, but in large quantities on its own, you really taste and smell the bitterness. In summary: We definitely think that application of the "hot" after frying is the way to go. Exact composition of the "hot" merits further experimentation. Stay tuned! OMG, this looks SOOO Good! Definitely gotta try this and definitely with some pickles. Thanks for the excellent post! Definitely don't forget the pickles (or the white bread). Without them, it isn't Hot Chicken. Holy heat! Melted lard on fried chicken. It does sound crazy good! I'm wondering if Prince's use something like Hawaiian Chili Water. That stuff is hot hot hot in a very addictive, burn a hole in your tongue hot. It doesn't have quite the red as the cayenne and lard. Or maybe it's a non-red type of pepper water. Just throwing out some ideas. Darn, now I'm craving fried chicken. Lard and chicken? Add a beer on the side and you've got the Holy Trinity of food. cabcooks - I'll have to look into Hawaiian Chili Water. 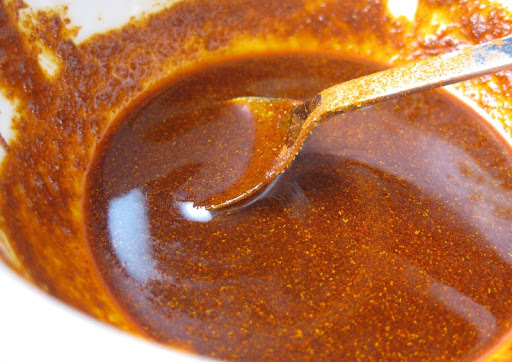 We've also thought about trying to make an infused chile oil using chile flakes. Hi Masa - yeah, there is definitely something addictive about really hot food. We are attempting to make hot chicken today by experimenting with a few different applications after frying the chicken. I will let you know how it goes. Thanks for the posting the pictures. Hi Renee - definitely let us know how it turned out. I looks like you hit up my favorite places in Nashville. Prince's, City House, and Arnold's. You must of had a pretty good tour guide. 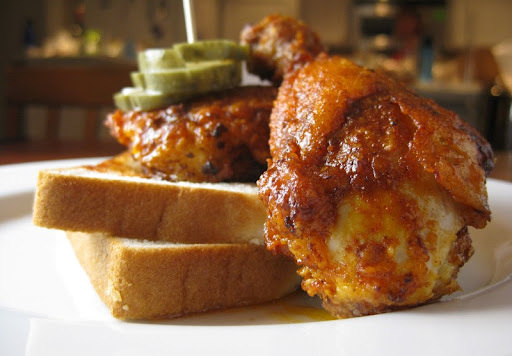 I started looking at your site for the charcuterie and I was shocked to see someone in Cali making hot chicken. Hi ULIKA BBQ - glad to hear we did ok in Nashville. We didn't have a guide, but I did a fair bit of homework on the internet. Very Nice Try! Many have tried and have come close to capturing the authentic taste of Prince's. 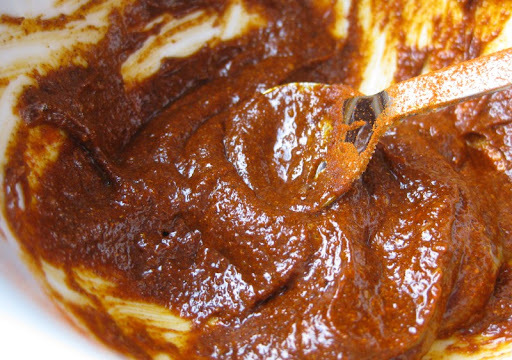 Ditch the buttermilk marinade, and drink it instead! I grew up in the kitchen at Prince's. My Auntie Andrea and Dad showed me the secrets of making Prince's Chicken. Its something that us "real" Prince family members hold dear and wouldn't tell a soul! I live in Northern California now and mmake it for my family, co-workers, and close friends. As for the recipe, we go to the grave with it!!! Our experiment was good but it wasn't Prince's Hot Chicken good...if you know what I mean! We found another recipe suggestion that we are going to try. I know if we keep trying we will figure this out. Hi Renee - let us know if you meet with success!